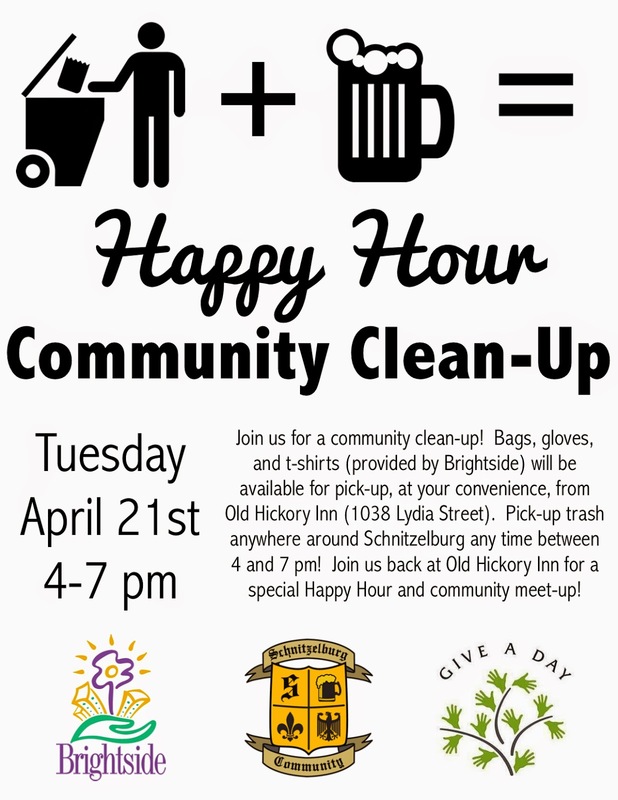 Schnitzelburg will be having a community-wide clean-up on on Tuesday, April 21st! The clean-up is in partnership with Brightside and The Mayor's Give a Day campaign. 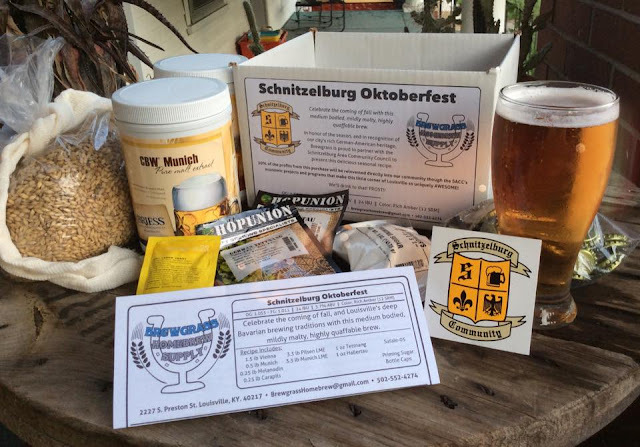 While most neighborhood clean-ups occur on Saturday mornings, we prefer to conduct ours Schnitzelburg Style - with beer! Any time between 4 and 7 pm, grab supplies (gloves, bags, t-shirts, etc.) from the picnic table on the Hickory side of the Old Hickory Inn. No need to check in! Just grab and go. Any time after you are finished picking up trash, come back to the Old Hickory Inn for special, extended happy hour prices. You'll deserve a cold one for keeping Schnitzelburg clean! But don't think the clean-up is just for adults: Kids are awesome, energetic helpers! The amount of litter you pick up is completely up to you! 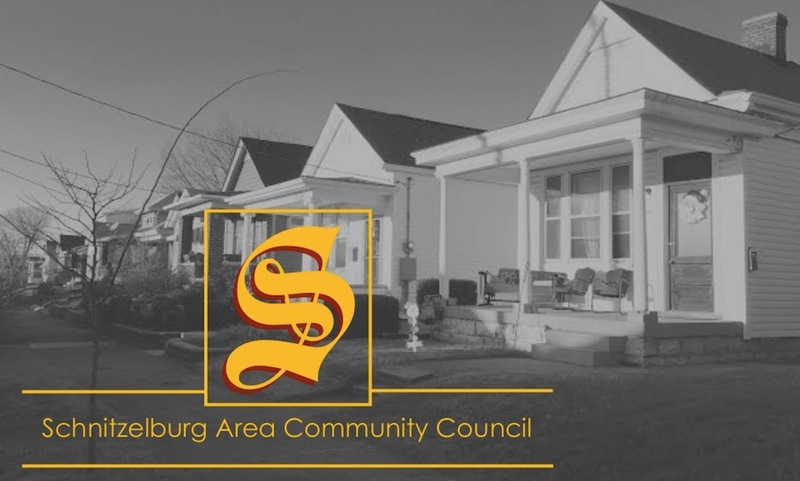 Whether you focus on your block, or clean-up an entire stretch of our more trafficked streets, like Shelby Street, the commitment to your community shows in just you participating, not the number of bags you fill up! If you don't fancy the happy hour, don't feel like socializing with neighbors, or only have a little time to clean-up, we invite you to clean-up the area around your house. Just a few minutes can make a big impact. Plus, it would be great to see everyone out and about, picking up trash, and investing in their neighborhood! Litter is ugly. No one likes to live where there is litter. Neighborhoods with a litter problem usually have higher crime, lower property values and less pride in their neighborhood. Litter begets litter. A place that is littered tends to encourage more litter i.e. a dropped off washing machine soon encourages other debris and a dump site is formed. So, the quicker dropped litter is picked up, the less chance it has of accumulating. Litter is also expensive. Every year, millions of dollars are spent cleaning up litter. Houses for sale in littered neighborhoods usually don’t get the best prices and owners lose money. Fires started by dropped or dumped litter cause millions of dollars of damage every year. Litter is illegal. Most people are unaware of littering fines. Most localities also have fines for businesses or pedestrians caught littering. Many people are unaware that the person opening a package of gum and dropping the wrapper on the sidewalk is doing an illegal act and, if caught, could face charges. Littering is against the law. Litter harms plants and degrades natural areas. When garbage is dumped, it can kill or stunt plant growth. Few people think about the harm to natural areas from litter. Litter kills or injures animals. Many small animals crawl into bottles or jars and get stuck and slowly starve to death. Animals get caught in plastic six pack rings, plastic bags, fishing line and a multitude of throwaways. Birds that are stuck, can’t fly away from danger. Sometimes animals caught in six pack rings are strangled as they grow too big for the opening. Animals get cut, infected and die. Every year, millions of birds, fish and animals die from litter. Litter is a problem that can be controlled. Education is an important tool. People who are aware of the dangers of litter often make more of an effort to always put their trash the correct place. They also spread the word to others they see littering and teach them to dispose of garbage the right way. Community clean ups encourage people to take pride in their community and keep it clean. Quick removal of litter keeps it from growing into an unmanageable dump site. People can make a difference. Litter can be conquered.